The collapse of Enron, WorldCom, and other large corporations in 2001 and 2002 motivated Congress to pass the Sarbanes-Oxley Act of 2002 (SOX). The purpose of this legislation was to restore investor confidence in the United States stock markets, and to prevent and detect fraud in financial statements as well. 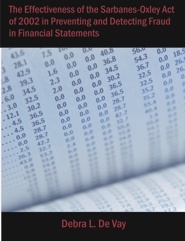 This dissertation examines the effectiveness of SOX for the latter purpose of preventing and detecting fraud, using statistical enforcement data presented by the Securities and Exchange Commission, and financial statement restatement numbers published by the Huron Corporation. The two methodologies utilized to analyze the data were the unpaired t test and the chi square test. Surveys were also emailed to executives and certified public accountants across the country to extract opinions as to the effectiveness of SOX. The statistical analysis results displayed that in 61% to 65% of the data sets, the numbers prior to the enactment of SOX were no different than the numbers subsequent to the enactment of SOX. The majority of the survey respondents feel that the benefits of SOX are not worth the costs, it is not effective in the prevention and detection of fraud in financial statements, and that it should be modified, but not eliminated entirely. While some sentiment exists that SOX is salvageable if revisions are executed, both the quantitative and qualitative analyses indicate support of the null hypothesis, that SOX is not effective in the prevention and detection of fraud in financial statements.